After their marriage at Mithila, Rama and Seetha return to Ayodhya. During the course of their journey, they meet Parasurama who, having heard the breaking of Rudra’s bow, challenges Rama with his bow of Vishnu. Rama once again proves his prowess by breaking the bow. 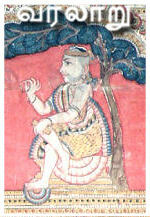 Parasurama realizes that he is an incarnation of Vishnu himself and provides his blessings. Upon reaching Ayodhya, the princes and their newly wed wives receive a warm and fitting reception. Rama’s journey from Mithila to Ayodhya is not elaborated in literatures. The only event that is dealt with to some merit is the Parasurama episode [Kambar: Parasurama Padalam]. However, the Ramayana panels at Pullamangai explicitly record the couple’s departure from Mithila and the fitting reception provided by the people of Ayodhya in good amount of detail. As many as seven panels have been dedicated to portray these events; two for the departure from Mithila, four for the reception at Ayodhya and one for the Parasurama episode. Considering the five panels that precede the departure to Ayodhya, as many as twelve panels have been dedicated to portray the events starting from Ahalya’s resurrection to Rama’s return to Ayodhya. This is a significantly high number (18%) – considering that only 64 Vedipada panels available at Pullamangai. Other Chola narratives such as Tiruchennampoondi and Thirumangalam – which include Rama’s marriage to Seetha - do not elaborate this departure and reception. This panel at Pullamangai is a singular theme not dealt with in any other Chola Ramayana narratives. It shows the newly wed couple walking out of the palace (or the marriage hall) and possibly looking at the processional arrangements. This is the first of a two part scene depicting Rama’s departure from Mithila. The panel is slightly damaged; however the characters are identifiable. Rama, the tall and slender figure, is sculpted in the left half of the panel together with Seetha. He is holding the left hand of his wife - suggesting reassurance and support. His right hand is raised in Pataka Mudra – as if he is pointing at something and explaining it. His posture is casual, relaxed and confident. Seetha, standing to the left of Rama, is portrayed as a much shorter figure. She is looking in the direction pointed at by Rama and is attentively listening to him. Her legs are straight in Sthanaka. The significance of their conversation is not well understood at present. Considering this panel in conjunction with the next one, we may suggest that this conversation is about the royal procession. 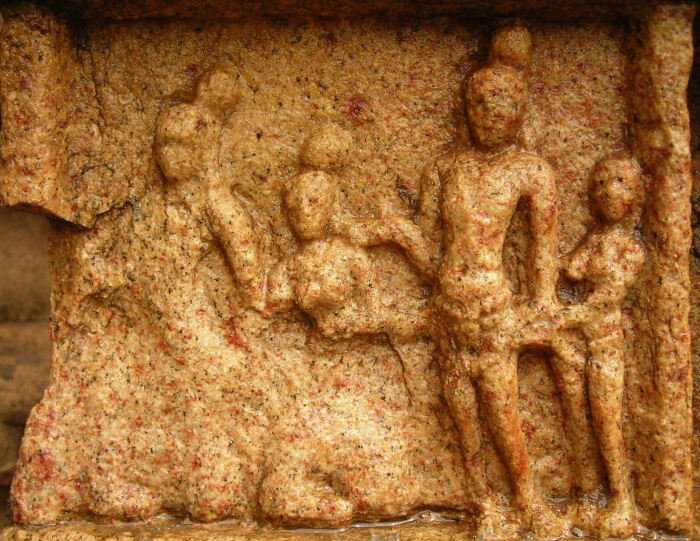 It is noteworthy that there are only two panels [No.19 & 20] at Pullamangai that show Rama hand in hand with Seetha. Both are related to the marriage and the aftermath. Also, Seetha is always seen giving her left hand and not the right hand to Rama. This might be a Chola tradition. Another male and female figure are seen to the right of Rama. Both are walking. This might represent Lakshmana and his wife Urmila or even Rama and Seetha undertaking a walk after their conversation. 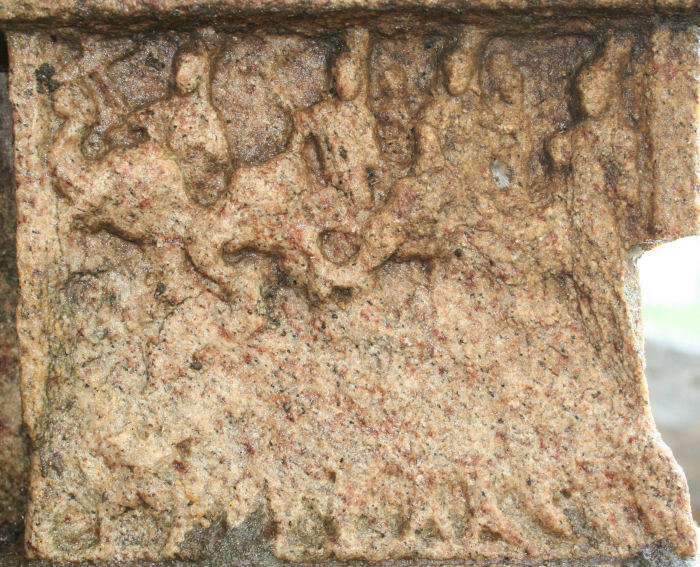 Three elephants with riders are sculpted in the upper half of the panel. A fourth male figure is standing to the left of elephants. The lower half of the panel is badly worn out; only the legs of a horse and marching soldiers [?] are partially visible. The rider to the extreme right of the panel is holding a royal canopy (Ven Kotrakkudai) in this right hand. There is a sense of pride and prestige in his posture. The canopy, raising above his shoulders, should be considered as a part of royal paraphernalia accompanying the procession. The elephant’s trunk is raised above his head in joyful temperament; possibly he is trumpeting. The second male figure is also holding a canopy – but his posture is composed. A small figure (possibly a female?) is seated behind him. It is difficult to ascertain if this figure is also seated on top of the elephant alongside the male rider or not. The elephant trunk is bent towards his neck; possibly he is eating something. The third male figure is holding on to something which is unclear. He is also seen in company of another figure (again, likely to be a female). His elephant is gently caressing the ears of the nearby elephant with his trunk. The first two elephants seem to be males and the third one a female. The varying moods of the three elephants is an expression of a master sculptor whose keen observation and comprehensive understanding of the animal behavior is brilliantly articulated in this panel. The fourth male figure is standing to the left of elephants. His gestures cannot be fully identified. This panel seems to depict the royal procession accompanying the newly wed couples on their journey to Ayodhya. This panel is a floral or vine motif design. Six such motifs are interposed between the Ramayana themes at various locations in Pullamangai. It is difficult to ascertain the significance of these designs and the purpose of such interposition. They might possibly represent the end of one part of the story and the start of another. By portraying Rama as the tallest figure in the group of four and by leaving sufficient space all around him, the sculptor highlights his importance and dominance. This concept of utilizing height and space to underscore the relative importance of a character in a given scene, is observed in many panels in the Chola Ramayana series. Both Rama and Seetha are sculpted in depth and are projected well out of the wall, as compared to other two figures in the panel. This is once again an attempt to emphasize the importance of the selected characters. Three elephants seen in the upper half of the panel might represent a part of the royal procession accompanying Rama and Seetha to Ayodhya. The lower half, which has worn out, might have contained representations of cavalry and artillery.